Just recently, it was a big bang for the country’s number one family fast food chain in town. JOLLIBEE has unveiled its newest batch of Yumbassadors – young Filipino achievers who have excelled and continuously trail blaze in their respective fields, serving as role model for today’s Generation “Y”. 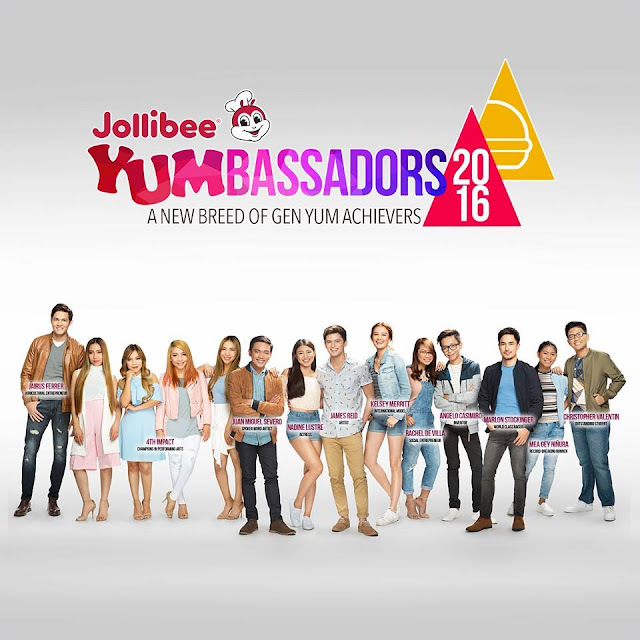 The entire range of One Esplanade in Pasay City, Manila went berserk when the world-class roster of these Yumbassadors was introduced one by one. These young talented artists are composed of the reel-and-real life couple James Reid and Nadine Lustre (who by the way not present at the moment because of their ongoing world tour journey). The introduction went on with the famous international race car driver Marlon Stockinger, international model Kelsey Merritt, social entrepreneur Rachel de Villa, young inventor Angelo Casimiro, spoken-word artist and performer Juan Miguel Severo, model and agricultural entrepreneur Jairus Ferrer, record-breaking runner Mea Gey Ninura, outstanding student and aspiring doctor Christopher Valentin, and the world-renowned all-girl group 4th Impact who donned their version of "BangBang".